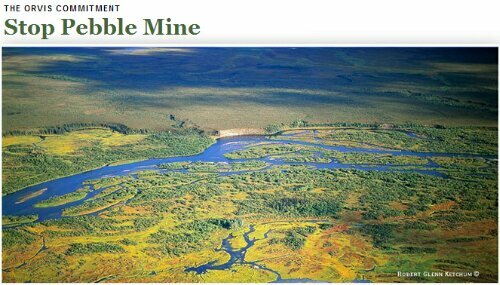 Pebble Mine, if built, will be one of the world’s largest open pit gold and copper mines, yielding 10.8 billion metric tons of ore of which 1% will be usable and 99% would be mine waste stored in what will be the world’s largest earthen dam reservoir – a reservoir that must exist and remain intact forever if the remarkable ecosystem of Alaska’s Bristol Bay is to survive. Any failure will be catastrophic to the surrounding environment. Events are underway to locate this mine on the headwaters of the Kvichak and the Nushagak Rivers which produce over half the salmon in the Bristol Bay Region. This region produces millions of wild salmon annually that represent the largest sustainable harvest of wild salmon on earth. It continues to support not only the indigenous people’s salmon culture that has existed for thousands of years, but is a significant protein source for the world, and the foundation of a food chain that supports not only more than 138 species of wildlife, from grizzly bears and river otters to shorebirds and bald eagles, but the surrounding flora as well. The pristine nature of this ecosystem is extraordinarily fragile and this is a massive gamble – a gamble which has inevitably failed in other salmon-rich drainages now either seriously degraded or eliminated altogether. This entry was posted in Arctic, Canada, diversions, economics, environment, fish, pollution, water, wildlife and tagged Alaska, Bristol bay, copper, gold, mining, Pebble mine, salmon.